I was looking to get myself registered with Instagram.com online on my PC and Mac but I just couldn’t find a way to do that. After hours of searching around for Instagram.com Sign Up online, only then I know what have to be done first before you can actually login to an instagram account. Disclaimer: I do not represent Instagram and this website is in no way affiliated with Instagram Inc. Everything written in this post about Instagram.com Sign Up is merely my experience from trials and errors and I think it would be very much helpful to share this with other people who may have met the same problem as I had. Well, if you don’t already know what Instagram is, you must have been living under a rock for the past several years. Instagram is one of the most dominant and fastest growing app in the world. It allows users to take photos and videos, and share them instantly on the social networks. It acts just like a social network where you get to add friends, like photos and videos, and comment on other people’s photos. With Instagram, you can certainly make your world much prettier by sharing the beauties around you with the people near or far away from you. Basically there are two ways to do an Instagram Sign Up online. The easiest one is by login to Instagram with your Facebook account and that it would mean you would be signing in to Instagram with your Facebook account. Another way, the most common one, is to do an Instagram sign up from your Android or iOS mobile phone. The reason that the sign up link is no where to be found on Instagram.com website is that the registration actually has to be taken place via your mobile phone. 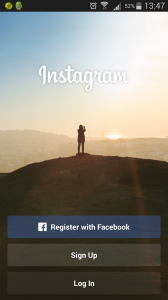 Instagram sign up with Facebook can be done on both a PC or a mobile phone. On your PC, open up instagram.com and click on the Log in button. On the next page, if you’ve previously signed in to your Facebook, you should now see your profile photo and a “Log in as” button. If it’s you on the profile picture, go ahead and click the “Log in as” button, otherwise click “Switch accounts” and then “Log in With Facebook”. Instagram will ask for permissions to use your basic account information from Facebook and you will have to allow them to do so. Once it’s done, you will be redirected to your instagram home page where you get to see all the updates from your friends. Update: You must sign up Instagram with Facebook via your mobile phone first before you can actually see the Facebook “Log in as” button on Instagram website. Skip to the next paragraph to learn how to do that on your phone. If you are on an Android or iOS mobile phone instead, head to the Playstore or App Store. Search for “Instagram”. Download and install it on your phone. Run the app and tap on “Register with Facebook”. Instagram will then ask for permission to access your basic information such as your email address. Tab “Ok” to allow it and wait for it to interact with Facebook. If you see the “Please reset your password to log in” message, proceed to reset your password. Once it’s done, you will be redirected to the Instagram news feed page. To sign up for Instagram manually on a mobile phone, first you will have to install Instagram from Play Store on an Android phone (or App store on an iPad or iPhone). Run the app and tap on the “Sign Up” button. Enter your email address, desired username and password, your name, and mobile phone’s number. You can also choose to use your Facebook info as your Instagram profile. By doing so you will link Facebook with Instagram and the next time you share a photo or a video, it will appear on Facebook as well. Once you’ve done entering the info, proceed to login to your account and start enjoying the awesome app.